If you are fudge lover, then you are going to LOVE this review and giveaway from The Mill Fudge Factory! They have the perfect gift packages of fudge for gifts this Valentine's Day and they put love and care into each fudge variety they offer! The Mill Fudge Factory artisan fudge has a distinctive flavor inspired by their own Scottish family recipe. With a smooth, melt-in-your-mouth texture and just the right balance of sweetness, their fudge comes in twenty-five delicious flavors. It's an artisan fudge handcrafted with the finest natural ingredients. They don't use any corn syrup, instead they use a little honey. This makes it very satisfying and not overly sweet. They don't use any artificial ingredients. It's based on their grandfather's recipe from Scotland. It's butter based instead of cream so it has a very smooth finish that melts in your mouth, but has more substance to it than some frosting-like fudge. I generously received the Hand Dipped Chocolate Covered Fudge Heart. 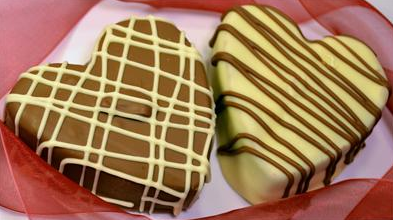 These are heart shaped Belgian Chocolate fudge hand dipped in Belgian milk chocolate or Belgian white chocolate. There are two 4 ounce hearts included in every gift box. It arrives boxed beautifully with a free red ribbon. I also received the Valentine's Gift Sampler. It includes four flavors combined with a Valentine's quote and free red ribbon to make the perfect Valentine's gift! Strawberry Fields Forever - Our classic penuche fudge infused with real strawberries and layered with white chocolate. Chocolate Raspberry - Our signature chocolate fudge infused with real raspberries and finished with our raspberry topping. NO artificial flavors or colors here! Raspberry and chocolate, the perfect partnership. Belgian Chocolate - Made with dark Belgian chocolate (62% cocoa), this fudge represents the perfect balance between intense chocolate satisfaction and a smooth easy-to-eat chocolate fudge. Original Penuche - The simplest flavor we make with only four ingredients! Cabot butter, cane sugar, milk and pure honey melt together to create a deeply satisfying caramel experience. All flavors come wrapped individually and weigh approximately 4 ounces each. 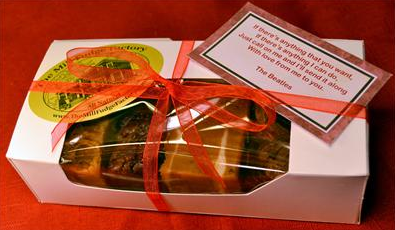 Fudge is a favorite treat in our house and it makes a great gift for Valentine's Day! I also love that all their fudge is handcrafted in small batches so you know you are getting the care and attention that delicious fudge should have! It is like eating fudge from your own kitchen! I generously received two great products from The Mill Fudge Factory that are also great Valentine's Day presents: the Hand Dipped Chocolate Covered Fudge Heart and the Valentine's Day Gift Sampler! My husband is a huge fan of strawberries and white chocolate so he LOVED the Strawberry Fields Forever fudge. If you are looking for a rich, delicious fudge without all the icky ingredients other fudge companies include in their fudge, then head over to The Mill Fudge Factory website and check out 25 of their delicious varieties! I don't think you can go wrong with any of them! Buy It: You can purchase all 25 delicious varieties of The Mill Fudge Factory from their website. Win It: The Mill Fudge Factory is generously offering (1) $15 gift certificate to TWO lucky winners!